Dudemeister over on the Iron Gods forum suggested that we should really give the characters a vehicle as it suits the wasteland setting so well. This is a great idea. So here is what I came up with. Thematically its very Warhammer 40k because in my personal campaigns version of the Iron Gods Divinity is actually a crashed Rogue Trader which was transporting a section of Adepta Sororitas soldiers and their equipment (along with a Cadian regiment – but thats another story). These are 5e stats and they are inline with something like a galley. The storm boltor is set to about the power of a 3rd level spell. There is also potential here for some running battles with high CR monsters if the players use the rhino to move across the Nimmerian wasteland. Or even epic chase scenes. The rhino would also be a perfect, albeit temporary host, for Cassandalee. I plan on both the Laud Hailer and the Storm Boltor to be a surprise for the players. This particular specimen was dug up by Hellions work crews and laboriously, slowly and meticulous restored to pristine working order. Unfortunately, once the rhino was fully operational it was discovered that it had its own cantankerous machine spirit – Cortina. This spirit is limited in function – as many spirits are within the Imperium – but is ancient and refused to take orders for what it perceived as a heretical AI in Hellion and mutants and xenos in the god’s entourage and locked itself down. Hellion plans to eventually overpower the machine spirit and take over but has recently been distracted by the loss of Meyanda and a new gang – The Crimson Lotus – who have been acting all to heroic to be a real gang. Cortina, as the rhino calls itself, is a technological artifact. It isn’t too bright and will take orders from the first human it perceives in the vicinity that asserts command over the vehicle. It can also drive itself and shoot the storm boltor however it isn’t very good at this and makes all checks with disadvantage and moves at half speed. Exits: Hatch at top, both sides and rear. Power Source: Atomantic Arc Reactor. Can combust almost anything for power. For every 10 gp worth of material dropped into the reactor Cortina gains a range in miles equal to 1 mile . This amount may be spent as the driver sees fit. Sentience. Cortina is a sentient lawful neutral vehicle with an Intelligence of 10, a wisdom of 10, and a Charisma of 5. It has hearing and dark vision out to a range of 120 feet due to the installed auspex. The vehicle communicates verbally with its owner/commander and can speak and read gothic. Personality. 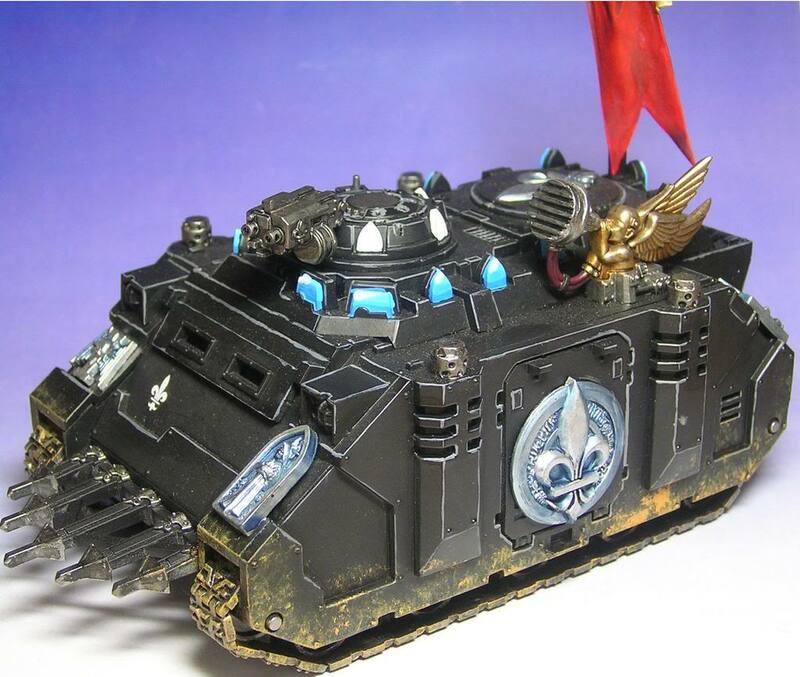 The vehicle’s purpose is to bring the Emperors’ light to the unwashed masses and server anyone who will seek out and destroy the heretic, mutant and xenos. What it interprets as each being is left to the DM’s discretion. If their is a conflict with its owner Cortina cannot take control of its owner but it will refuse to function until “brought around”. It also can instruct the crew in how to do basic repairs. It requires maintenance which can be performed by anyone with the cbyerthuergy skill under instructions from Cortina. To abstract this away it costs 10gp per day of use and 50gp per month of inactivity to keep her in working order. Actual damage costs 100gp per hit point of damage and 1 day to fix. Dozer Blades. These are designed to clear the way for the rhino. However, since these are made from skymetal they are effective rams against non-skymetal structures (for example wood or stone). They act as a ram against such objects (DMG pg. 255, +8 to hit, 16 (3d10) bludgeoning damage)). Laud Hailer. Once per day Cortina can emit a heavenly voice proclaiming the righteousness of the Emperor and strikes fear into the hearts of the enemy. This acts as a bless spell for the vehicle occupants and crew (so up to 10 creatures) and a bane spell for targeted enemies. Pintle-mounted Storm Bolter. Cortina has a hidden storm boltor which it can deploy as needed. The storm boltor requires the Big Guns proficiency to be used effectively. It also uses special ammunition called bolts. Different kind of bolts can have different kind of effects and damage ratings. Cortina comes with a cache of 20 blessed ammunition – standard bolts. This give +1 to hit and damage (not included below). Storm Boltor. Ranged Weapon Attack: +2 to hit or as gunner, range 100/200 ft.; one target. Hit: 15 (5d6) explosive (1/2 fire and 1/2 force) damage. Half this damage if Cortina is firing as opposed to a gunner. Searchlight. The Searchlight is an Imperial and Chaos vehicle upgrade for use during night fighting scenarios. While it is useful for illuminating enemies, it also makes the vehicle with the searchlight mounted on vulnerable to return fire from the enemy. This acts as a daylight spell centred on the vehicle. Smoke Launchers. Used by all Imperial forces and the Chaos Space Marines as a vehicle upgrade. They are effectively small grenade launchers mounted to the front of vehicles loaded with smoke charges. They temporarily hide the vehicle behind a wall of smoke and is useful for providing cover, especially when the vehicle is out in the open. This acts as the fog cloud spell. Mounting Weapons. Some technological vehicles are capable of supporting mounted weaponry. These spots fall into three categories, relating to the type of structure they anchor to: hard points, firm points, and soft points. Hard points are durable load-bearing points on a vehicle capable of supporting a heavy technological weapon, firm points are strong enough to support up to a two-handed technological weapon, and soft points are capable of supporting a light or one-handed technological weapon. Mounting or unmounting a technological weapon requires the Cybertheurgy skill, 8 hours of uninterrupted work, a successful Cybertheurgy check (DC 25). Once mounted a technological weapon is integrated to a technological vehicle’s power source for purposes of charges depleted when fired, and any unspent charges on a weapon when it is mounted are lost. Mounted weapons can be targeted by attacks and sunder attempts as normal. Mounted weapons not attended by a gunner count as unattended objects. Each weapon mount on a vehicle has a descriptor that determines how it is able to fire, detailed below. Fixed: A fixed mounted weapon can only fire in one direction, typically forward, and is limited to targets located in a line extending out from the square the weapon is mounted in. Articulated: An articulated mounted weapon is situated on a turret, arm, or other sort of mobile platform and can fire in any direction. Maintenance. Cortina can instruct the crew in how to do basic repairs. It requires maintenance which can be performed by anyone with the Cybertheurgy skill under instruction from the machine spirit. To abstract this away it costs 10gp per day of use and 50gp per month of inactivity to keep it in working order. Repairing: A character with the Cybertheurgy skill who succeeds at a DC 20 check repairs 10 points of damage to a technological vehicle. Repairs of this nature require 8 hours of uninterrupted work. A failed check still repairs 5 points of damage, but failure by 5 or more instead inflicts 5 points of damage to the technological vehicle and gives it the timeworn status until the vehicle benefits from a successful repair or benefits from make whole spell. Actual damage costs 10 gp per hit point of damage in materials as well. Picture credits Lancastrian Gaming Club and Game Designer Workshop.